IDF forces discover and neutralize explosives planted on security fence of Hamas-enclave Gaza. IDF forces discovered two explosives planted against the security fence on the border with Gaza on Tuesday, during routine activities in the area. The explosives were neutralized without causing any damage or injuries. Terror sources continue using the area adjacent to the security fence to plan attacks against Israeli citizens and security forces, noted the IDF in a statement. An advanced terror tunnel from Gaza was discovered last Thursday by IDF forces. While Hamas originally claimed the tunnel was old, IDF investigations revealed the tunnel was "the longest and most elaborate revealed to date," according to an official. "We found tools, generators and additional equipment which indicates that it was being used in the past several days," noted the official, adding "Hamas is building these tunnels to kidnap and kill [IDF soldiers], because only then do they think they can get [Israel] to release more [terrorist] prisoners." This is far from the first case of explosives being placed on the security fence. In late January a bomb was detonated on the fence, causing no injuries. Just the week before, another explosive went off near the fence, again causing no injuries. 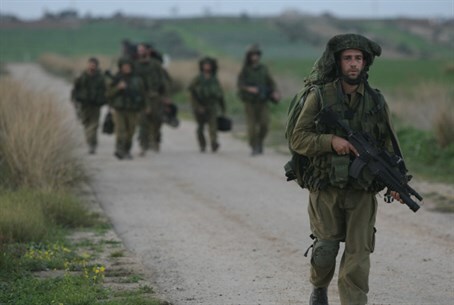 An explosive placed on the Israeli-Syrian border last Tuesday exploded as an IDF jeep passed nearby, leaving three soldiers lightly injured. In response, the IAF conducted an airstrike on Syrian army positions, which aided the attack.